What are the causes of tearing in adults? Tearing in adults is one of the symptoms that most often causes eye consultations. Although they tend to get confused, we refer to tearing in cases in which there is excessive tear production. We use the term epiphora when tears produced in normal amount but cannot be evacuated entirely. For convenience we will discuss tearing without making specific references to each term. It is most common in people aged 60 years and over and in women, probably due to anatomical causes. There is a basal tear secretion and another that appears in response to stimuli or aggressions. The tear is continuously produced, part of which is evaporated, and the remainder is drained through a drainage system which is the lacrimal duct. Evacuation takes place in an active mode, and is not only induced by gravity. Blinking is essential to push the tear toward the puncta and then the rest of the drainage system. The route begins in the lacrimal puncta, housed in the lower lid and the top. From there through the canaliculi converges in the lacrimal sac, which lies between the eyeball and the nasal bone. From the lacrimal sac descends the nasolacrimal duct which opens into the posterior part of the nasal cavity. - Excess production (hyperstimulation, corneal irritation and triggering of the tearing reflex): dry eye, blepharitis, environmental irritation. - Drainage failure: failure in the mechanism for pumping and suction of the tear: facial palsy, aging, rubbing of the area, ectropion. - Mechanical obstruction of drainage: punctal stenosis, canalicular obstruction, obstruction of the nasolacrimal sac or duct, congenital obstruction. Obstructions caused by infection, trauma, malignancy or dacriolitiasis. The causes of tearing are varied. From an oculoplastic standpoint, the first thing we determine is whether it is caused by a cause of lacrimal obstruction or is nonobstructive. There are rare causes. They may be caused by dog bites, assaults using the hands, or cuts from objects. It is important to try by all means to save the canaliculi, both top and bottom. In the event of isolated trauma to the upper canaliculus, sometimes it is deemed irrepairable and attempts of recanalization are avoided, since the function of tear drainage is less important than that of the lower. However, with the lower canaliculus recanalization should by all means be reattempted, although this is not easy. The surgery should be done as soon as possible, within 48 hours, as there is a great tendency to retract the same and adjacent tissues. - The first is to channel the two mouths of the lower canaliculus, turorizing them with a probe, and then close the surrounding tissues. The probe keep it for 3-4 months. - In another procedure, the metal probe is used as a handle which is inserted through the upper canaliculus and seeks its way to the bottom, from where the silicone tube will be hooked to remove it again by the upper end and tie the two ends. These are surgeries that have some degree of difficulty, due to the caliber of the tubules. Sometimes microsurgery is required. 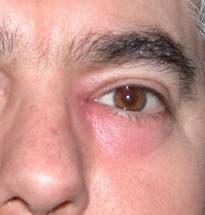 The causes are many: infectious (after conjunctivitis), inflammation, tumour, traumatic or malformations. Blockage may develop along the anatomical pathway of the lachrymal duct. Depending on where it occurs it influences the type of treatment. We may have strictures (narrowing) or punctal absences (atresia or agenesis). 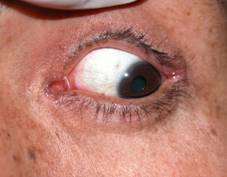 The most common site of obstruction in adults is at the junction of the sac with the nasolacrimal duct. The main symptom that occurs is logically epiphora. However, secretions may also occur. 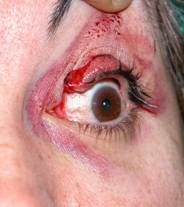 The patient may notice that the eye is just wet or that he can shed a tear. Sometimes it happens only on the street, in winter or when the wind blows (situations where there is more tear). At other times it is permanent epiphora. The consequences of this are that the patient continuously has to dry and rub his eyes to relieve symptoms, eventually resulting in changes to the eyelids, such as hypermobility, and deficits in the pumping capacity of the tear. This is important because in these cases even after lacrimal surgery is successful, it can be a little watery due to this eyelid laxity, which also should be corrected. 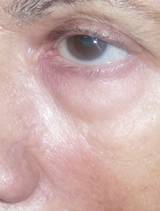 The continued friction can cause eyelid laxity. 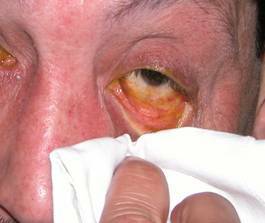 Another less common symptom, but more important, is infection of the lacrimal sac, with repeated episodes of conjunctivitis, leading to the appearance of dacryocystitis. Dacryocystitis is an acute process requiring treatment with oral and topical antibiotics and systemic antiinflammatory drugs. 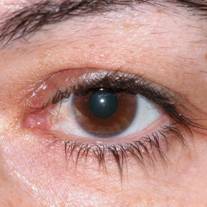 It is a process that causes great pain and swelling around the eyes, a sore spot on the area of the lacrimal sac. 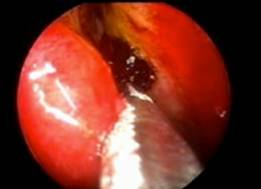 In patients who have episodes of dacryocystitis, surgical treatment is recommended, prior to planning future cataract surgery, in order to minimize the risk of intraocular infection. 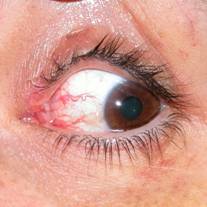 How is lacrimal obstruction diagnosed? 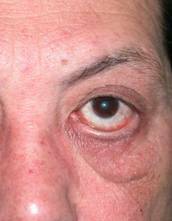 Diagnosis is based on symptoms referred by the patient along with exploration of the lacrimal duct. This can be done in several ways. The most common, in consultation with punctal probing and canaliculus, made with a special and very fine cannula. It is a painless procedure but can be somewhat annoying. Thus ophthalmologist evaluates the obstruction. Another test is involves radiation andi s called dacryocystography. The technique is the same as that previously described but with a biologic type of contrast obtained from a plant. He made two or three plates to see the passage of contrast and thus better assess their journey. No proof is necessary. 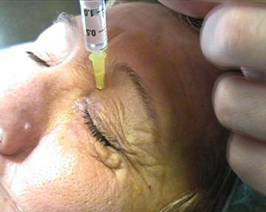 How is blockage of the tear ducts treated? 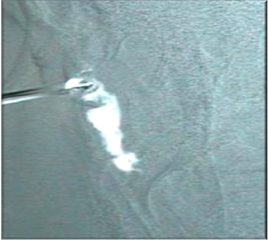 The goal of surgery is to open a tunnel, fistula or by-pass over the site of the obstruction. We do not try to unblock the damaged area but attempt to create artificial communication. Therein lies the difficulty of this surgery and its failure rate, as the body tends to close any unnatural hole we attempt to create. There are basically three techniques, each with its pros and cons. Your surgeon will tell you what is best for you. Dacryocystorhinostomy (DCR) remains the procedure with the best success rate, very similar to endonasal dacricistorhynostomy. 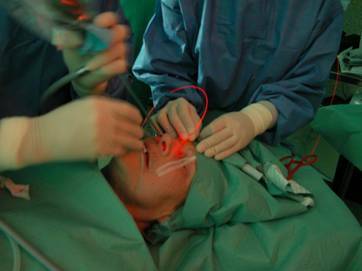 The latest laser technology has poorer outcomes in terms of success. Surgery in the three cases can be done with local anesthesia and sedation, although it frequently requires general anesthesia. 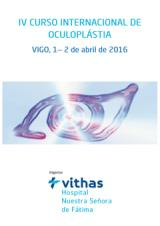 A complete preoperative study is required prior to surgery. Particular attention must be paid to those patients treated with anticoagulants. DCR is not contraindicated in patients taking aspirin or anticoagulants, but precautionary measures must be undertaken. There is no age limit for this surgery. Sometimes we do a surgery called differently. This is practiced in those patients in whom old age or physical condition cannot undergo dacryocystorhinostomy. 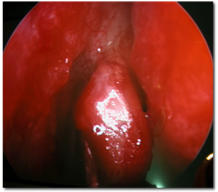 In this surgery we remove the lacrimal sac, without creating a new drainage pathway to the nose, which will therefore not alleviate tearing symptoms. Our aim is to cure their infection, known as dacryocystitis. Surgery is performed under local anesthesia. It usually is performed in a short period of time. 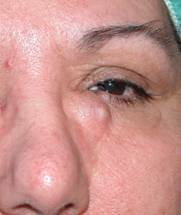 The patient should know that the lacrimal sac can regenerate and therefore infection may recur. This happens in up to 5-10% of cases treated. This technique is the oldest but still the most effective in terms of success rate. It is performed under local anesthesia and sedation. Here we make an opening in the lacrimal sac, the lacrimal bone and the mucosa of the nose, carving and creating a tunnel that will tear. Surgery can last 30-50 minutes. 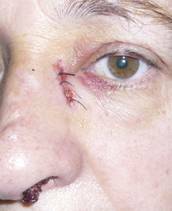 It is necessary to make an incision on the skin at the tear. Disadvantages: skin incision. The percentage of scars is very low: less than 3 per thousand. Before a tube end is placed within the silicone with the lacrimal duct to somewhat ensure permeability. At other times and especially in second interventions we can apply mitomycin. This drug is a potent inhibitor of cell growth, slowing healing. It is not routinely used due to possible side effects. It is important to instruct the patient not to pull these tubes. These tutors or silicone tubes are removed in two or three months, and we do it in the office, from the nose, in a normally painless procedure. In this case surgery is done through the nostril. From there it pierces the nasal mucosa and bone of the nose into the lacrimal sac. The advantage is the absence of scarring on the skin. Disadvantages: in very narrow nostrils, or trauma, its realization is difficult. 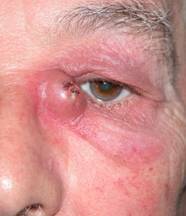 It is not indicated in suspected tumours involving the lacrimal sac. At the end of surgery silicone tubes are placed. It is the newest technique. Thanks to flexible glass microfibers that are introduced through the puncta and canaliculi, osteotomies and reaching the nose by means of laser pulses. This technique is less aggressive than the previous two. The drawback is the high failure rate. Silicone tubes are also placed in these patients are mitomycin is more often used. This surgery is performed in cases where obstruction is at the level of the canaliculi, rendering dacryocystorhinostomy ineffective. We must create a drainage path above and we do not have enough space to carve a tunnel. 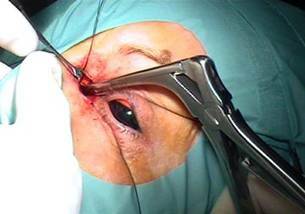 In this technique we introduce into the lacrimal angle wattles, a glass tube directly reaching inside the nose. 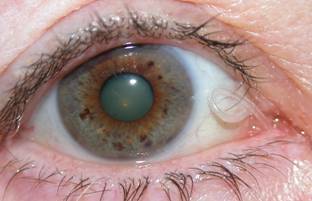 This technique is used only in cases with considerable symptomatology since the failure rate is very high. The patient is 24-48 h with a stuffy nose that will retire in the query. 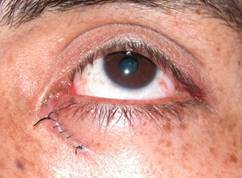 The eye can be covered with an occlusive patch for 24 hours. Afterwards antibiotic ointment must be applied to the incision if applicable. It is important to clean the nostril daily and apply a topical anti-inflammatory for a few days. Your ophthalmologist will give a protocol regarding care after surgery. 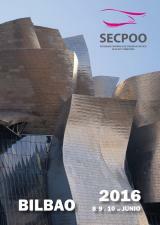 The success of surgery can be assessed and in the early days, in which the patient feels a great improvement in tearing. Failure can occur in the first few days or weeks. Failures are rare after the third month, permeable pathway can last a lifetime.